Be leaf me or not, but I have been one busy bee. I have not wrote a blog post in over a month and there is a V good reason for that! 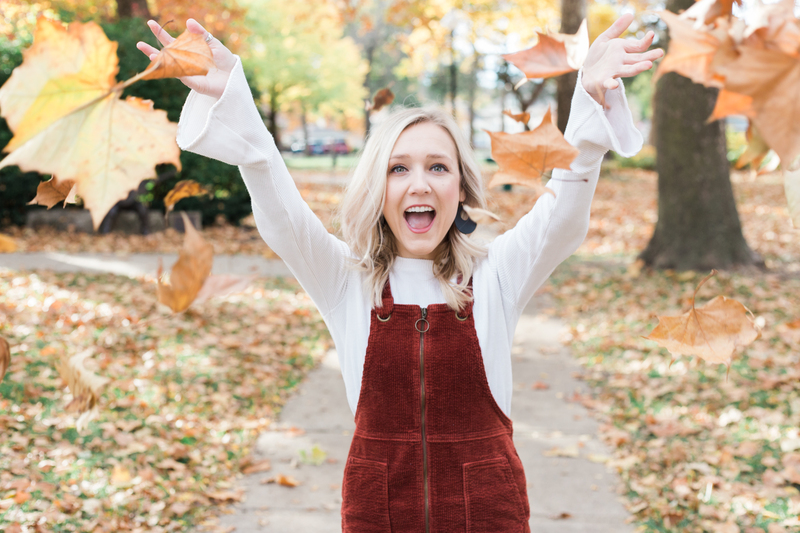 Life has been a little crazy and I plan on writing a separate blog post for that! 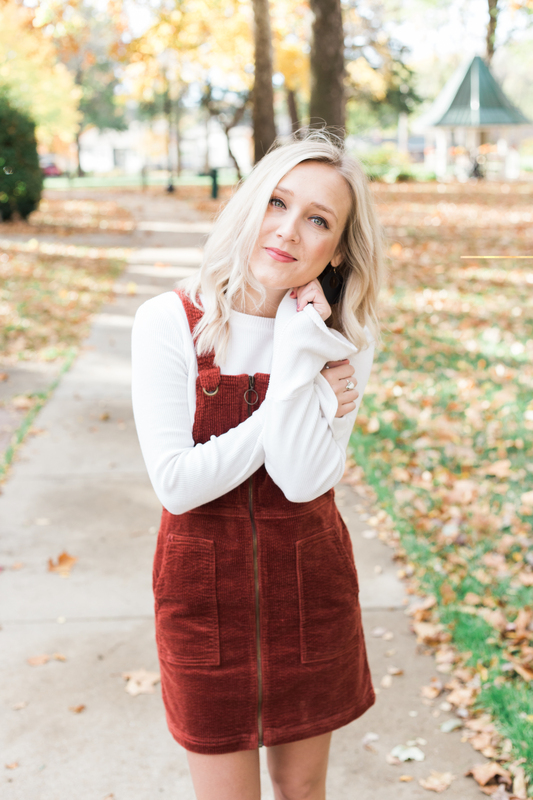 So until then I am sharing with you my favorite Fall style dress. 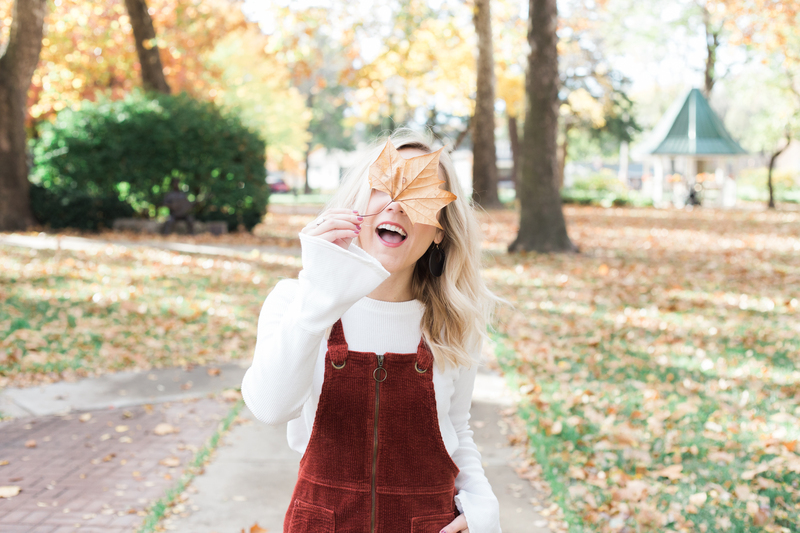 This rust color corduroy overall dress is to cutest thing I think I have owned all season. 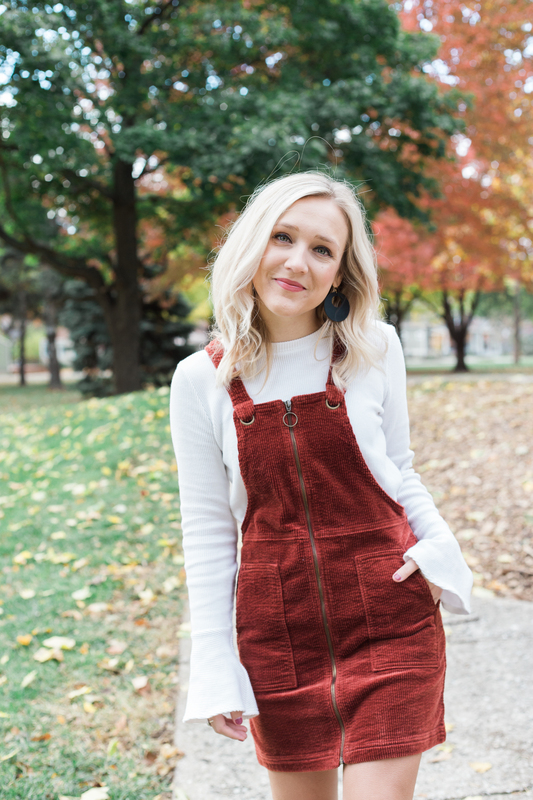 You can shop this outfit here! Good Morning! I know I know, I have been MIA for a while. I wanted to share with you all one of my favorite things to do as the seasons change. I don’t know about you all but I love transitioning my closet between seasons. How do I do this? I put all my summer clothes into a bin, my tanks, dresses, cover-ups and sandals. I then unpacked all my fall/ winter shoes, coats, and bulky sweaters. I hang up all the clothes in order, with sweaters being in a section, and long sleeve and short sleeves being in another section. I then of course put up my shoes! I was just talking to one of my co-workers about how I absolutely love fall/ winter season clothes. There is so much more of a variety. Don’t get be wrong, I love summer and spring. But there is just something about bulky sweaters and layering I enjoy much more. 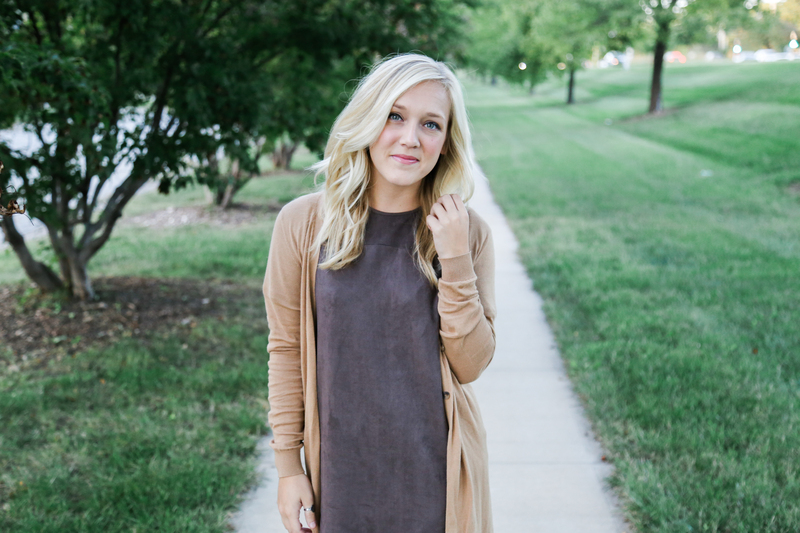 For this outfit I took this simple suede dress and added a fun long cardigan for this brisk weather and paired it with my favorite Steve Madden booties of the season. Autumn is officially here. I have to say this is my favorite season, literally everything about it. 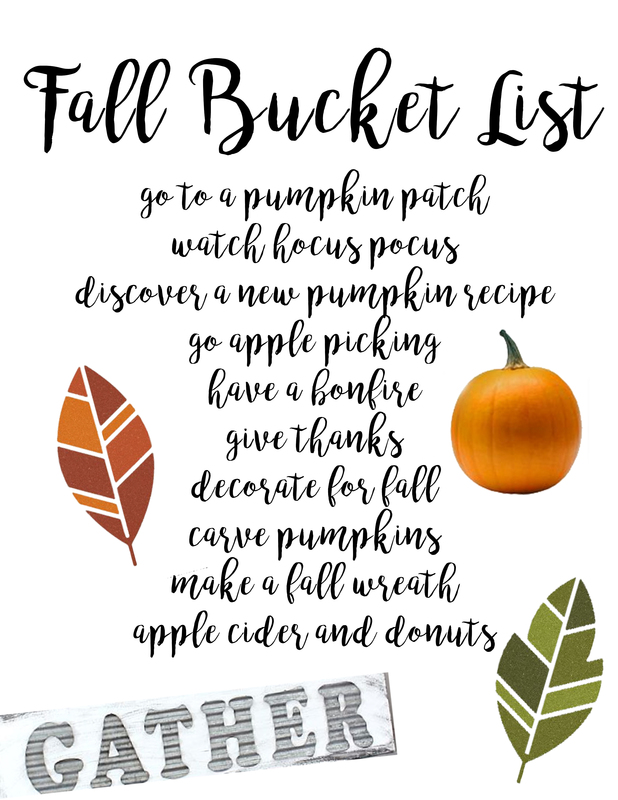 I have put together a fun bucket list that I thought I would share with you all. ! It’s been a crazy last month with fixing up our new house, and finally being all moved in! It surely has been a process and I am SO SICK of trips to Home Depot, I think its safe to say that today was my last trip there for a while. I can’t wait to get settled in and enjoy the fall weather, pumpkin spice candles, baking and spending time by the bon fire. I made my first loaf of pumpkin bread with peanut butter chips. It was yummy! For those of you who are wondering about the house. It is coming along, we are waiting on our dining room table to be made, should be here within 3 weeks! I cannot wait to start decorating the formal dining room. The kitchen is finally done and organized, that has been the biggest project! Everything else is coming along, I am just so glad we are finally here. Luther is having a hard time understanding what is going on… with the workers coming in, the MAIL MAN! He hates the mail man :/ Hopefully he will learn soon to stop barking at literally every single person that walks up to our door. He has become super protective over me, which is good but also has its down falls. Life is great! and we are figuring out this whole adult thing with having a house now. Its fun 🙂 I hope y’all have a great weekend! !